Rocky Patel in a verdant field of tobacco growing in Estelí, Nicaragua, not far from his newest cigar factory. Patel’s premium cigar operation is growing ever more integrated. Vertical integration is something that Rocky Patel has been thinking about for a long time. As a concept, it’s simple—control every aspect of production, from raw materials to manufacturing to distribution. Many cigar makers in the premium sector claim to have complete control. Few actually do, but if Andrew Carnegie could pull it off with his steel company, why not Rocky Patel? He sits sedately at a long table in a windowless chamber that’s part conference room, part kitchen, and his hair appears overly gray under the harsh florescent lights. Just the night before, he was hosting a Super Bowl party in Queens, New York. A few days before that, he was in Mexico. Today, he’s at his TaviCusa factory in Estelí, Nicaragua. This isn’t a facility that he sublets, nor a space that belongs to anyone else. It’s his, and it’s precisely this ownership that gives him tighter rein on a process already fraught with variables. He lights up a concept cigar, a contender to become part of his portfolio of brands, which accounted for nearly 20 million in unit sales in 2013. It has no name, just a number. After a few puffs, the 53-year-old puts it down and makes a face as though he’s just tasted something sour. He places it on an ashtray and looks for another cigar. This reject is one of many blends put together for him at Tabacalera Villa Cuba S.A., more casually known as TaviCusa, the home to an increasing number of his blends, including Rocky Patel Royale and Rocky Patel Fifteenth Anniversary. Patel takes the two-hour flight from Miami to Nicaragua whenever he can just to oversee the operation, albeit intermittently. The world-weary Patel has spent a particularly exhausting decade on the road promoting his large portfolio of brands. No venue is too small, no shop too remote. It doesn’t matter if you’re a member of Russian parliament at a cigar bar in Moscow or a city employee at some coffee shop in Bayonne, New Jersey. If you’re willing to try any of Rocky’s cigars, he’s willing to traverse the globe just to shake your hand and talk—sometimes quite floridly—about the smoke and all that’s gone into it. His presence is a supplement to the brand, and being everywhere at once has paid off. His sales have grown from 16 million cigars in 2010 to almost 20 million now, and Patel finds himself with more assets than ever before. His company owns two tobacco farms in Nicaragua, the 8,000 square-foot TaviCusa factory in Estelí and a portfolio of more than 100 brands, each of them distributed through Rocky Patel Premium Cigars Inc. out of Naples, Florida. Add to that the giant facility in Honduras also dedicated to producing myriad Rocky Patel cigars such as The Edge, which is owned by father-and-son team Nestor Plasencia Jr. and Sr. and their work on Patel’s brands has helped lay the foundation for what’s becoming Patel’s mini cigar empire. In addition, Patel also entrusts General Cigar Co. to produce his Vintage 1990, 1992 and 1999 cigar brands. They’re made at Scandinavian Tobacco Group, Danlí, a huge factory that was once the UST factory. Patel gets up out of his seat and migrates from the makeshift conference room into the lobby. He passes a shrine of Rocky Patel products displayed in a glass humidor before opening a pair of swinging saloon doors that lead directly to the rolling room. Here, under the strong, phosphorescent glow of more fluorescent lights, 72 rollers make 10,000 cigars per day—and Rocky has complete control. Patel’s expansion to Nicaragua started in 2009 with the opening of the first TaviCusa, which Patel started with Amilcar Perez-Castro. At that point, his brands were made mostly in Honduras. TaviCusa was a small, 3,000-square-foot-building committed to producing cigars like the Rocky Patel 1961 (now a catalog line), Fifteenth Anniversary, Zen by Nish Patel, Thunder and Rocky Patel 50. While the Honduran factories churned out other brands under the supervision of their own respective management teams, Patel had something else in mind for TaviCusa. By 2010, TaviCusa moved and expanded into something more than just a side project. The much larger building presently sits on a newly paved side street right off of the Pan-American highway in Estelí. According to Patel, Perez-Castro trains all the rollers to learn and adopt the house style until it becomes second nature. Now that Estelí is a booming cigar town, prospective rollers sometimes come to TaviCusa with no experience, while others who have defected from other factories need reprogramming to unlearn bad habits and take on TaviCusa’s production methods. Perez-Castro’s standards are exacting, and Patel is willing to invest the time to ensure that his employees make cigars the way he wants them to. When this larger facility first opened in 2010, it produced 800,000 cigars in its first year. By the end of 2011, TaviCusa was up to 1.2 million, and in the third year, it saw production numbers of 1.5 million cigars annually. It’s expanded at a pace that Patel considers “controlled growth,” but now, at just over 2 million cigars per year, he feels that TaviCusa has reached maximum capacity and doesn’t want production to outpace his inventory. A typical cigar brand out of TaviCusa takes about eight months to develop and Patel says that he works on every blend with Perez-Castro, a partner and primary operations manager who Patel trusts implicitly. The 42-year-old, Cuban-born Perez-Castro acquired his skills and sense for tobacco in Cuba during the early to mid-1990s before coming to the United States. He further developed his craft working for Ernesto Perez-Carrillo in Miami and then José “Pepin” Garcia at El Rey de Los Habanos, also in Miami. Eventually, Perez-Castro partnered with Patel. “I really should give Amilcar his own brand,” says Patel. “We should call it A.P.C.—No, wait. There’s already an E.P.C. cigar. We’d get sued,” he says with a chuckle. “Some people don’t care about that sort of thing. I’ve had actual blends stolen from me. I remember developing a blend and letting someone in the industry try it. Soon after, they made the exact same cigar and released it as their own brand. It’s still out there and pretty popular. They claimed that they tweaked it, but I knew it was mine.” Patel doesn’t rant when he recounts the story, but tells it rather resignedly as though it’s simply an inevitable fact of the business. Patel is most interested in making sure that TaviCusa keeps an extensive store of diverse and properly fermented tobacco and that these stocks are always available for experimentation and, eventually, commercial release. Should he get the creative bug, Patel’s inventory of tobacco includes Nicaraguan varieties from Jalapa, Estelí, Condega and Ometepe; Honduran tobacco from the Jamastran Valley; American tobacco leaves, Pennsylvania and Connecticut Broadleaf; Brazilian Mata Fina; Mexican San Andrés; Ecuadoran Havana; and even some Panamanian leaf. According to Patel, if his tobacco has not undergone enough fermentation, he’ll be able to detect the actual fertilizer used in the fields once he smokes it. He says he knows the taste of boron, of potassium, and years have taught him the characteristics of each leaf and their respective regions, and whether or not they’ve reached their flavor peak during the fermentation process. Even if the casual smoker cannot readily identify boron or potassium, Patel believes that his customers will at the very least know the cigar doesn’t taste right. Brands are where Patel’s outspoken philosophy and practice meet. Anyone can pay lip service to standards or quality and it’s sometimes difficult to pull Patel out of his promotional mode of speaking—the man is always selling. But cigars from TaviCusa tend to perform well in Cigar Aficionado’s tastings and the ratings certainly support some of his claims. Recall Cigar Aficionado’s Top 25 Best Cigars of 2013; the Rocky Patel Fifteenth Anniversary Robusto took the No. 18 spot. In 2011, the Torpedo from the same line was named No. 6. With dark, Ecuadoran Havana wrapper and beautiful box pressing, both scored 93 points and are not only distinct smokes, but emblematic of what Patel expects from his Nicaraguan operation. Or consider TaviCusa’s Rocky Patel Royale line. It consists of Nicaraguan filler, two binders (Connecticut shade and Connecticut broadleaf) and an Ecuadoran Sumatra wrapper. The Torpedo from that line scored 91 points (Cigar Aficionado February 2014) and the Toro 92 (Cigar Insider, November 2013). Remember the Rocky Patel 50? It was the most expensive cigar line Rocky Patel had ever put out, and yes, the box was a bit excessive in its design (wood grain veneers, brushed copper plate, amber crystals) but the Robusto size took the No. 8 position on Cigar Aficionado’s Top 25 Cigars of 2012 with a score of 93 points. Patel points to consistency as a keystone to quality. By rejected, Patel means that the cigar is repurposed and sold as a factory second, not disposed of. However Patel is clear that other than a color discrepancy or blemish on the wrapper, there is nothing structurally wrong with the cigar. Anywhere from 33 to 36 percent of his cigars do not make the final grade and are reclassified as a second, sold off in the catalogs under a different name. In terms of volume, TaviCusa’s biggest cigar brand is the Fifteenth Anniversary. It produces 1,500 of these smokes per day. Brands like Royale, Bold and Platinum are a close second. About 10 percent of total production there is reserved for private labels. 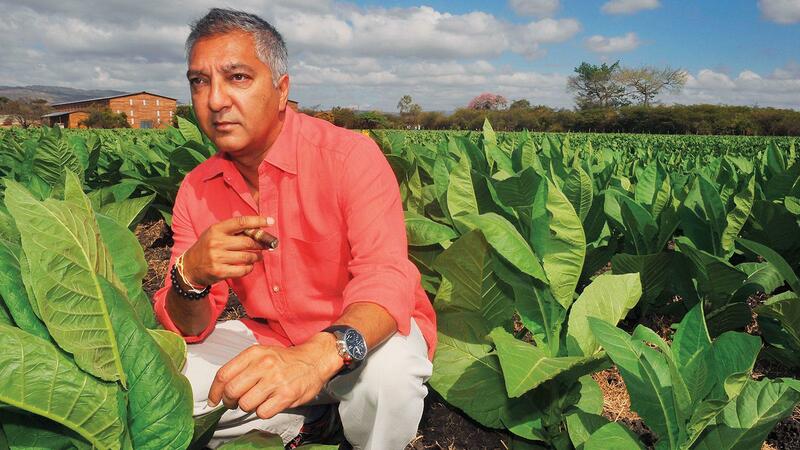 And although most of the tobacco used in TaviCusa’s brands is purchased from leaf brokers, Patel is now using some tobacco that he grew himself. About three years ago, he signed a 10-year lease on an 80-acre farm in the Condega region of Nicaragua where he grows mostly filler. That tobacco has recently found its way into new brands like Rocky Patel Bold, Platinum and Royale. Last July, Patel signed another 10-year lease for a plot of land right in Estelí only a few miles from the factory. A quick drive up the Pan-American highway and a few turns onto some bumpy unpaved roads and Estelí’s cityscape of painted concrete huts and bunker-like buildings turns pastoral and silent. Once you get passed the armed guards at the gates, the mountainous vista opens up to a lush field of tobacco. Verdant rows of Criollo ’98 flutter in the mountain breeze. They were planted last autumn in the coal-black soil of these fields and were ready for harvest by early February. As the sun gets lower in the sky, shadows make the details of each gleaming leaf more pronounced. A tobacco farm in the late morning takes on a different look in the late afternoon, but the sky is still quite blue and clear. About 60 percent of the field is planted with the seed variety known as Criollo ’98. By mid-February, the lower primings of the Criollo plants had been harvested and hung to dry in the farm’s new 20,000-square-foot tobacco barns. During that harvest, seeds for Havana 2000 were planted on other sections of the land. This seed varietal accounts for about one-third of the farm. The rest is dedicated to experimental seed types, such as Sanctí Spiritus. Early May will signal the end of the growing season and as excited as Patel is over his tobacco in Estelí, none of it will be used in a cigar until 2015. Patel can’t be sure how any of it will taste, nor is he certain about how much of his crop will produce wrapper leaf, but he’s nevertheless enthusiastic about growing in an area known for producing distinct tobacco and estimates that right now 20 percent of his TaviCusa inventory comes from his own farms. After Estelí is normalized into his rotation, the number could possibly double. Since his start in the post-boom cigar industry of the late ’90s, he’s forged a loyal audience of smokers and corralled a workforce that spans three countries. Patel’s original Indian Tabac brand, once his signature and defining cigar, is now the purview of catalogs and online retailers—an afterthought when considering the evolution of his company and the relationships built with not only brick-and-mortar retailers, but directly with cigar smokers. The business model is now set and Patel’s personality is inextricable from the line, but he’s not doing it alone. His brother Nish and his cousin Nimish Desai have brands of their own under the Rocky Patel Premium Cigars umbrella, and are trying to do the same peripatetic brand-building that has made Rocky’s cigars so successful. With almost 20 million cigars made each year and dozens and dozens of brands to support, diversifying to TaviCusa helps to ensure against the dangers of homogenization. Nobody wants their body of work to include 20 brands of cigars that all taste the same. Never to stay in one place for too long, Patel is back at the factory having his assistant book a flight back to Naples, Florida, for the next day. Nish will be celebrating his 50th birthday at their cigar lounge, Burn, and Rocky Patel is set to start another leg of his own, never-ending tour.